Yuan Changming (China/Canada) is 9-time Pushcart nominee, grew up in rural China, began to learn the English alphabet at 19, and published monographs before moving to Canada as an international student. While pursuing his graduate studies in University of Saskatchewan, he helped establish the Saskatchewan Chinese Monthly, and served as its chief editor until 1992. 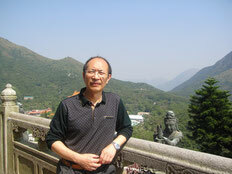 After obtaining his PhD in English, he began to work as a private tutor in Vancouver. In early August 2004, Changming started to write poetry in English and is now probably the world's most widely published poetry author who speaks Mandarin but writes mainly in English: since mid-2005, Changming has had poetry appearing in more than 1,000 literary journals/anthologies across 38 countries.